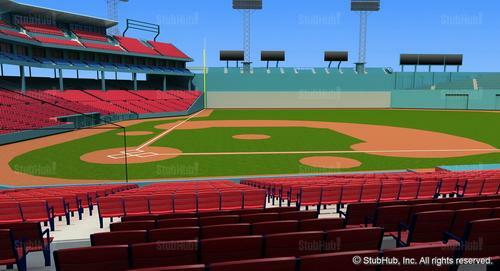 Awesome Seats Between Home Plate and Red Sox on Deck Circle. Note I only have 13 games left of 4 tickets - they would include 5 Yankees games - total $5,872 all at FACE value. I have 3 games 2 tickets for those also - 16 games it is $6,066 at face. have put down $104 per ticket which is average price for single game tickets - they range form $71 - $137 per ticket per game. I let buyers choose tickets on a 1st come basis, with 10 packs getting aYankees game. Once the games are chosen then will calculate actual cost for each game. Have done this in the past and works out well, also we make it easy to flip tickets amongst ourselves if something comes up and you cannot make the game. I accept paypal as well for payment. I can send actual tickets if you want as well. Happy Holidays! No you can use cashiers check - no issue. now I see the 8 games - again no issue. Hopefully every thing will work. You pay the $40 and they connect us. Ye I can make sure you get one or both of those games if you want them. Certified check sounds easier so good with that as well. We should get contact details once you accept the final offer. Yes went through. I have had folks use this system and be very happy. as you can see the seats are prenominal. I tried the spreadsheet does not work to drop in here. You can buy 10 games , go through the contract. At about $104 per game - we can go figure out which ones. This would be a start. what's the total cost for all of the available games? $15,704. Sorry I could not put a spreadsheet in. Do you still have all 65 games available? I'd be interested in purchasing 4 tickets to all of the available games. If so, which games would NOT be included? NO I have less. Let me list what I have, below. This forum is not the best but it works and have had partners from the board fro several years. Looks like I have about 37 games - which includes 4 Yankees games - Home Game #	START_DATE	Day of week	Price per ticket	Game Price	SUBJECT START DATE	SUBJECT 3	4/13/2016	7:10 PM	Wednesday	$71 $284 Orioles at Red Sox - Time TBD 5	4/16/2016	4:05 PM	Saturday	$104 $416 Blue Jays at Red Sox - Time TBD 8	4/19/2016	7:10 PM	Tuesday	$71 $284 Rays at Red Sox - Time TBD 11	4/27/2016	7:10 PM	Wednesday	$71 $284 Braves at Red Sox - Time TBD 13	4/29/2016	7:10 PM	Friday	$137 $548 Yankees at Red Sox - Time TBD 15	5/1/2016	8:00 PM	Sunday	$137 $548 Yankees at Red Sox - Time TBD 17	5/10/2016	7:10 PM	Tuesday	$71 $284 Athletics at Red Sox - Time TBD 20	5/13/2016	7:10 PM	Friday	$97 $388 Astros at Red Sox - Time TBD 21	5/14/2016	1:05 PM	Saturday	$104 $416 Astros at Red Sox - Time TBD 24	5/21/2016	4:05 PM	Saturday	$111 $444 Indians at Red Sox - Time TBD 26	5/24/2016	7:10 PM	Tuesday	$71 $284 Rockies at Red Sox - Time TBD 27	5/25/2016	7:10 PM	Wednesday	$71 $284 Rockies at Red Sox - Time TBD 29	6/3/2016	7:10 PM	Friday	$111 $444 Blue Jays at Red Sox - Time TBD 33	6/15/2016	7:10 PM	Wednesday	$97 $388 Orioles at Red Sox - Time TBD 34	6/16/2016	7:10 PM	Thursday	$97 $388 Orioles at Red Sox - Time TBD 36	6/18/2016	4:05 PM	Saturday	$137 $548 Mariners at Red Sox - Time TBD 37	6/19/2016	1:35 PM	Sunday	$111 $444 Mariners at Red Sox - Time TBD 38	6/20/2016	7:10 PM	Monday	$97 $388 White Sox at Red Sox - Time TBD 40	6/22/2016	7:10 PM	Wednesday	$97 $388 White Sox at Red Sox - Time TBD 43	7/2/2016	7:15 PM	Saturday	$137 $548 Angels at Red Sox - Time TBD 44	7/3/2016	1:35 PM	Sunday	$111 $444 Angels at Red Sox - Time TBD 46	7/5/2016	7:10 PM	Tuesday	$97 $388 Rangers at Red Sox - Time TBD 47	7/6/2016	7:10 PM	Wednesday	$97 $388 Rangers at Red Sox - Time TBD 48	7/8/2016	7:10 PM	Friday	$111 $444 Rays at Red Sox - Time TBD 53	7/21/2016	7:10 PM	Thursday	$104 $416 Twins at Red Sox - Time TBD 54	7/22/2016	7:10 PM	Friday	$111 $444 Twins at Red Sox - Time TBD 55	7/23/2016	7:10 PM	Saturday	$137 $548 Twins at Red Sox - Time TBD 56	7/24/2016	1:35 PM	Sunday	$111 $444 Twins at Red Sox - Time TBD 57	7/25/2016	7:10 PM	Monday	$104 $416 Tigers at Red Sox - Time TBD 58	7/26/2016	7:10 PM	Tuesday	$104 $416 Tigers at Red Sox - Time TBD 60	8/9/2016	7:10 PM	Tuesday	$137 $548 Yankees at Red Sox - Time TBD 63	8/12/2016	7:10 PM	Friday	$111 $444 D-backs at Red Sox - Time TBD 65	8/14/2016	1:35 PM	Sunday	$111 $444 D-backs at Red Sox - Time TBD 68	8/28/2016	1:35 PM	Sunday	$104 $416 Royals at Red Sox - Time TBD 70	8/30/2016	7:10 PM	Tuesday	$97 $388 Rays at Red Sox - Time TBD 72	9/12/2016	7:10 PM	Monday	$71 $284 Orioles at Red Sox - Time TBD 73	9/13/2016	7:10 PM	Tuesday	$71 $284 Orioles at Red Sox - Time TBD 75	9/15/2016	7:10 PM	Thursday	$137 $548 Yankees at Red Sox - Time TBD Let me know. I try to balance Weekday/weekend/and months but these are what I have now. This listing has been saved by 73 people.